You can think about your driveway from various perspectives. If you take a negative viewpoint, your driveway will be like an imposter to you, disrupting the view of your preened and polished garden. Does the thought of industrial-style tarmac make you squirm? Is your driveway nothing more than an eyesore in an otherwise calming sanctuary? It’s more likely that you feel somewhat neutral about your driveway, without giving it much more than a second thought. Well, why should you? Here’s why. A driveway is one of the defining features that helps to shape your home’s exterior. The edge of the driveway creates simple lines for the eye to follow, making it an important characteristic that is instantly noticeable to others. Your driveway paints a picture of your house, helps to form a passerby’s first impression and acts as the first interaction that a visitor will have when entering your home. With this said, you should carefully consider how you can design a driveway that accurately represents you and your home. If the interior of your home is perfectly pristine and meticulously maintained, your driveway deserves the same treatment. Here’s how to design the perfect driveway that will give off the right impression. Your driveway should be designed so that the route is clear and makes logical sense. 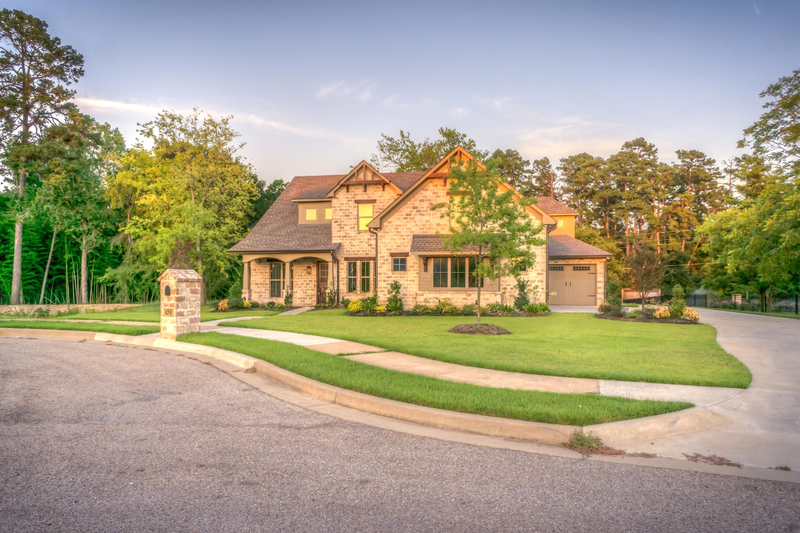 Most driveways begin by bridging with the pavement and end at the entrance to your garage (or something along those lines, where a singular straight path is formed). This straight approach is a logical and aesthetically pleasing format, which is why it is so popular among homeowners and developers. If you have a different type of layout to the exterior of your home or if you want to make the most of your garden space, your driveway might look different. A complex driveway system could lead to several paths so that the user can access the front door, the garage and the shed (if you have one). Either way, your walkways should have neat lines. This means that you should also pay close attention to the edge of your grass and any overspilling plants positioned nearby. Once you have determined the route of your driveway system, whether it’s to create a simple place to park close to your door or an access point to several areas of your home, you need to create a clear border. This design tip will enhance your driveway, whatever your initial plan. But how can you create a clear border? Using paving stones that differentiate the driveway surface to either the public footpath or the garden is an effective way to add design and distinction to your border. There are tons of paving stone types that can you use depending on your visual preference. Go one step further and install outdoor lighting to the perimeter of your driveway. You can purchase individual lights that pin into the soil to form a runway of lights either side of your walkway, which not only only makes your route more visible at night but also generates that “wow” reaction from neighbours and anyone passing your property. If you live in a gated complex, this is also a great way to keep a close eye on your pets if they regularly roam around the front of your home at night. In this sense, not only do decorative lights provide a sense of style, but they also act as a practical light source for added security. For an ethical choice without the compromise, seek out solar-powered lights, which remove the need for excess energy use. These allow you to impress without using more energy than is necessary. If you squirm at the thought of industrial-style tarmac, we’ve got a simple solution. Coloured tarmac drives allow you to get creative with your home’s appearance. Who says that a driveway can’t be a statement piece? With coloured tarmac, the options are endless. With a plethora of colours to choose from, you can find a shade that suits your property’s character and your unique personality. Choose a colour that represents you. If you prefer muted and understated design, you should opt for a subtle tone, such as a neutral stone-like shade. If you believe that “the bolder, the better”, you can find coloured tarmac in primary colours including red and blue to satisfy your need for a vibrant pop. You’re likely to be an avid gardener, otherwise, you wouldn’t be on this blog, right? If you’ve got green thumbs, your garden should be at the front of your mind throughout the entire process. The key principle to follow is that your garden and driveway should complement each other — they shouldn’t be competing for attention. Choose a colour palette based on the hues of your shrubbery and plant your flower beds so that they align with the arrangement of your driveway. Driveway feng shui may not be a “thing”, but we think it should be.